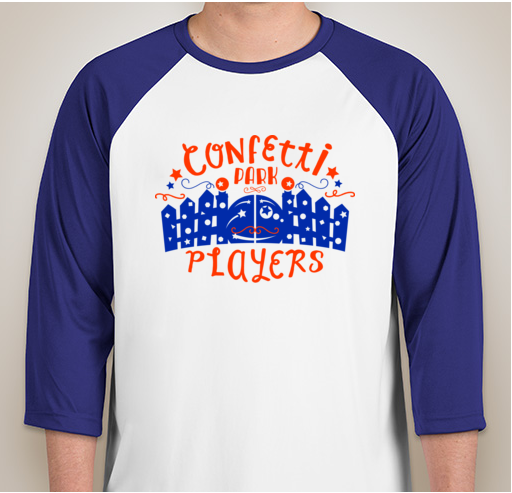 The Confetti Park Players baseball tee is the official uniform of the Confetti Park Players chorus! We wear it with pride at our events and on the playground, too! (Unless we are dressed like pirates.) The Confetti Park Players baseball tee is available to friends, family, and fans of the Confetti Park Players. All proceeds help fund Confetti Park Players activities such as studio recording sessions, video shoots, field trips, and regular choir activities (crafts, instruments, etc.). Thank you for showing your support! For sizes 2XL and larger, there is an additional charge of $5.